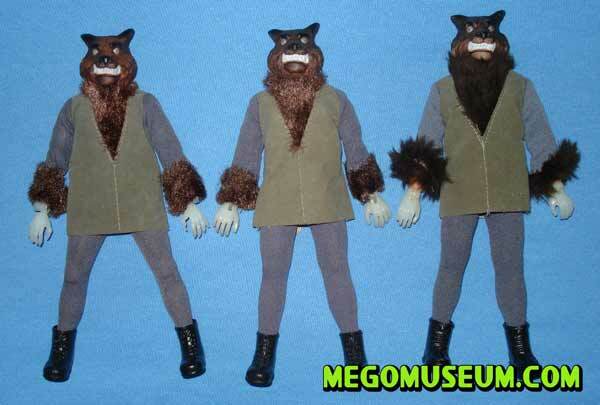 The Mego Human Wolfman figure is the most liberal adaptation of the character, the headsculpt is nothing like the movie monster and looks more like something out of folk lore. His head sculpt, with fangs drawn, makes him one of the more impressive mad monster figures and he is the second hardest to find packaged. The Wolfman was also released on a type two body as well but these can be prove difficult to find. Picture courtesy of Charlie Balicki. 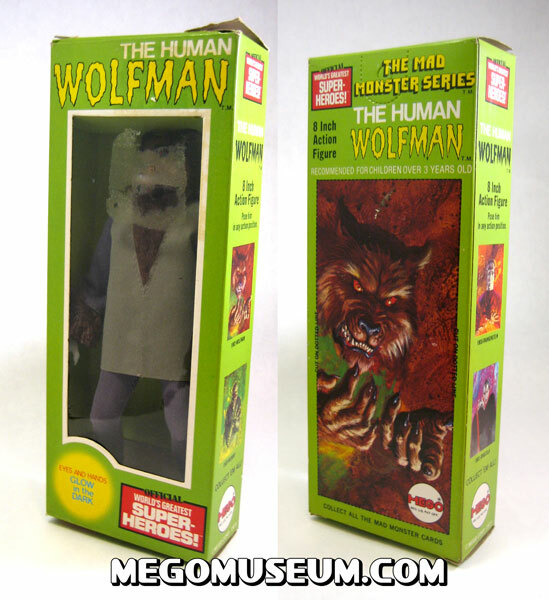 The Wolfman is most commonly found packaged in his original solid box although out of the four monster figures he is the most elusive. All of the Mad Monsters were released on Kresge Cards and remain difficult to find. Kresge Wolfman from the collection of Charlie Balicki. 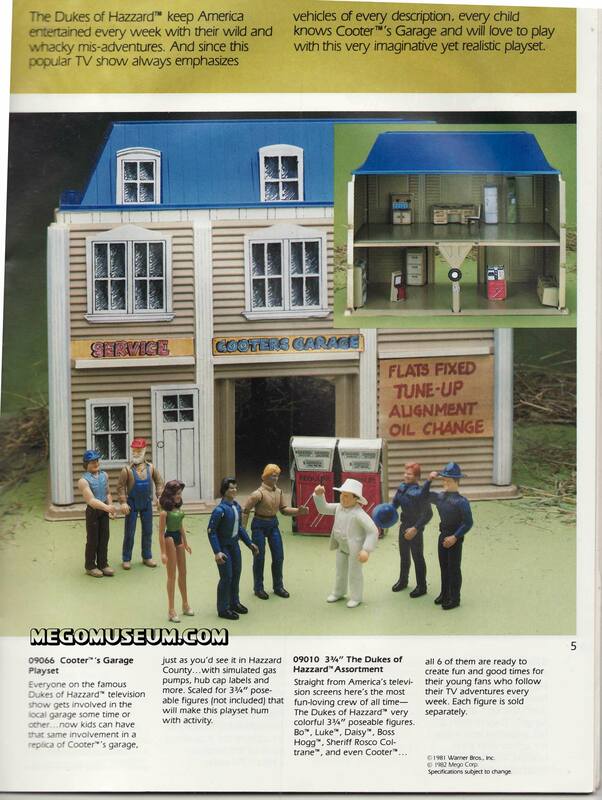 Mego briefly released the Mad Monsters in window boxes, one of the tougher sets to complete. 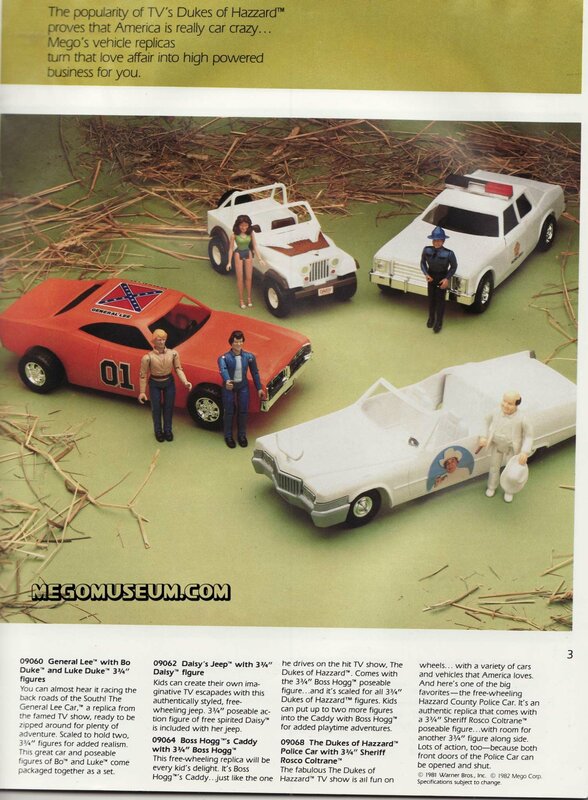 The Wolfman’s green cardboard prison is the second most difficult to find. Picture courtesy of Scott C Adams. 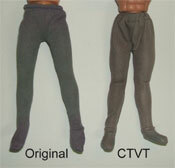 Wolfman’s pants have been factory reproduced by Classic TV Toys. The repro pants have a wider waist seam and are slightly different in color and material, with a more shiney appearance. The original is a more pure gray in color while the repro has a tan appearance. They fit more loosely in the pelvis area than originals and are unmarked. 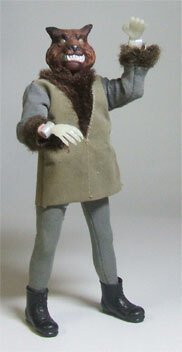 Wolfman’s coat is made of a velvet type material along the body with sleeves made of the same material as the pants. The coat also has fur sewn into the chest area and cuffs. The coat has been reproduced by CTVT and the sleeves have the same material as the pants with the same color and texture differences. The repro has a more tan look and is a more shiney material, while the original is a more pure gray soft material. The body of the repro coat is a little darker in color on the repro and if velvet material can have a grain, the velvet on the repro has a larger grain. The cuff’s and chest on the repro feature very short short, much shorter than an original Wolfman coat. The CTVT coat is much longer than the original Mego coat, and doesn’t have the seam going down the front middle that the Mego coat does. 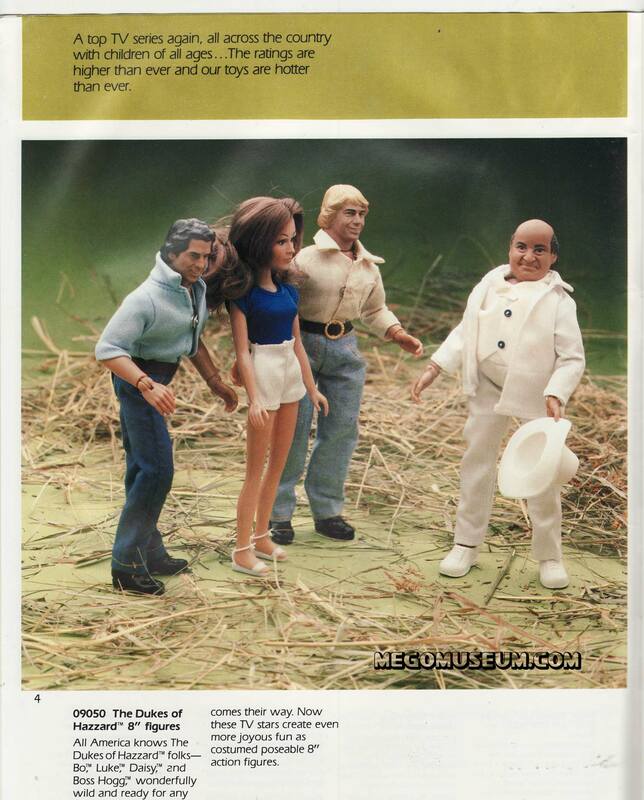 Mego also produced the Mad Monsters under the banner of their Lion Rock name. The Wolfman coat on the LR version features a long fluffy fur is totally different from the shorter bristle like hairs on the standard Mego issue. It’s also totally different from the fur on the CTVT Wolfman reissues. Which is more like beanie baby style velour type fur. 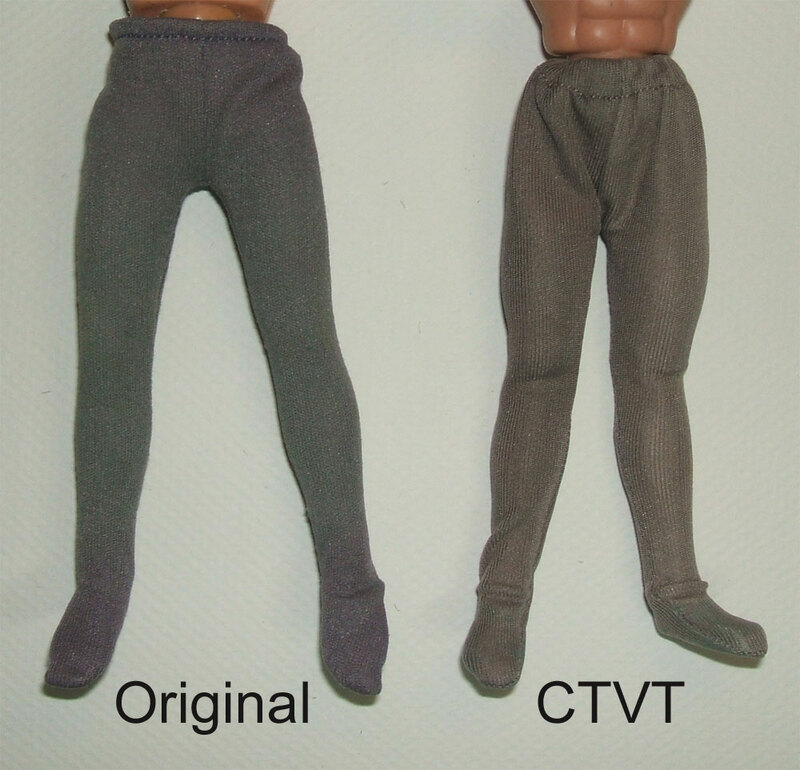 The thread on the body portion of the LR version is also much lighter than the standard Mego or CTVT versions. Wolfman wears a short version of the Mego combat boot also found in the Action Jackson Navy set and on the Planet of the Apes Astronaut. 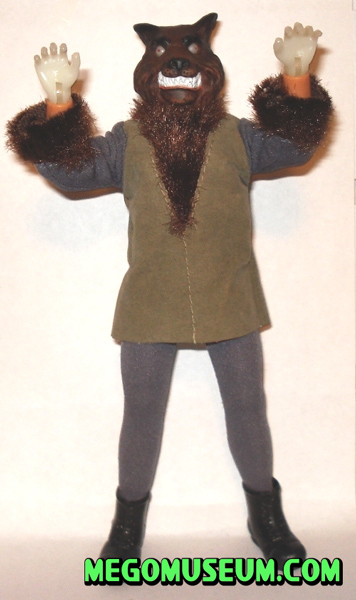 Classic TV Toys has reproduced the boot, although they didn’t include this reproduction on their reissue of the Wolfman figure. 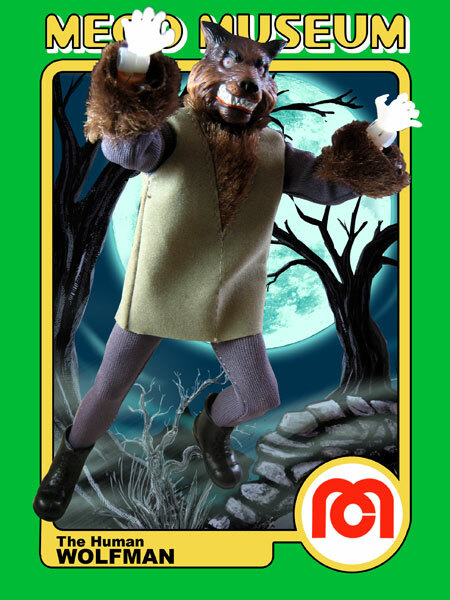 Instead, the CTVT Wolfman wears reproductions of the Mego black dress shoe. The CTVT short combat boot reproduction is a touch smaller and has more flashing evident. The reproductions are unmarked. CTVT also makes a full lenth combat boot (see Soldier Ape in the POTA section) and this boot can be cut down to make an almost factory reproduction of the short Mego combat boot. The full size combat boot reproduction is a very soft rubbery material when compared with the original and is also unmarked. 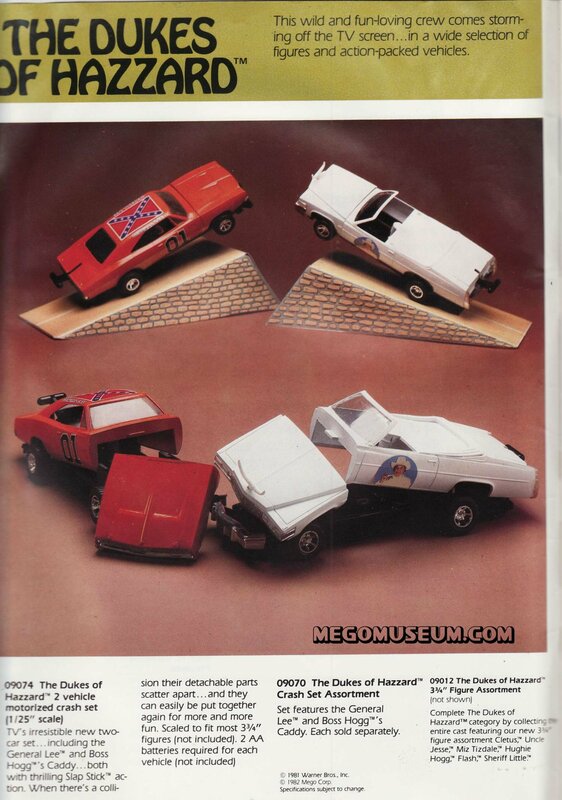 Mego also produced the Mad Monsters under the banner of their Lion Rock name. The boots worn on the Lion Rock versions of the Monsters differ from the original Mego version. The LR boots are more clunky and less rounded looking. The original Lion Rock boots have not been factory reproduced. Original Wolfman, like the other original monsters, has glow in the dark eyes, which sometimes suffer from what is called “eye melt”. The material used in the making of the glow in the dark eyes can sometimes turn to goo. 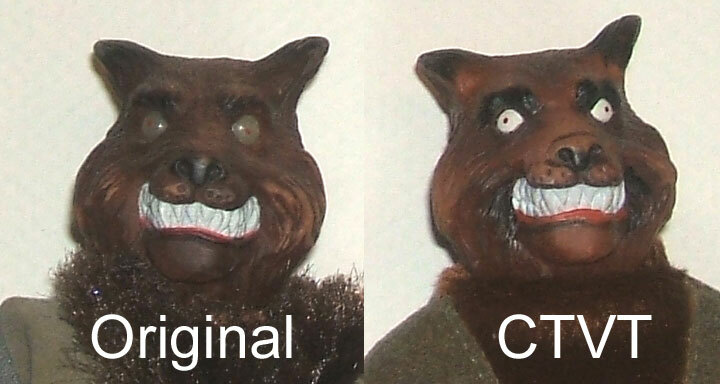 Wolfman’s head has been reproducted by CTVT but without the plastic made glow eyes, the repro head has painted glow eyes. The CTVT head is pretty accurate although there are some paint differences. The repro nose isn’t painted solid black like the original and the brown paint on the repro is a touch lighter shade. The repro is unmarked. 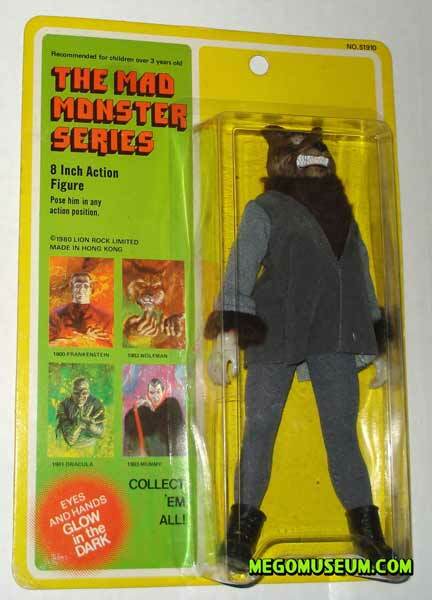 The Monster body types are covered on the Mad Monsters index page, but the Wolfman features something unique to the character. 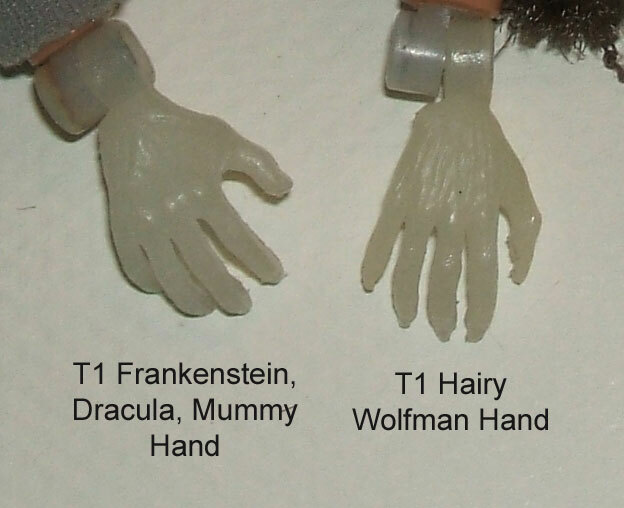 Both type 1 and type 2 versions of the original Mego Wolfman have a unique set of hands. For the Wolfman, Mego sculpted a hairy hand that the other monsters do not have. 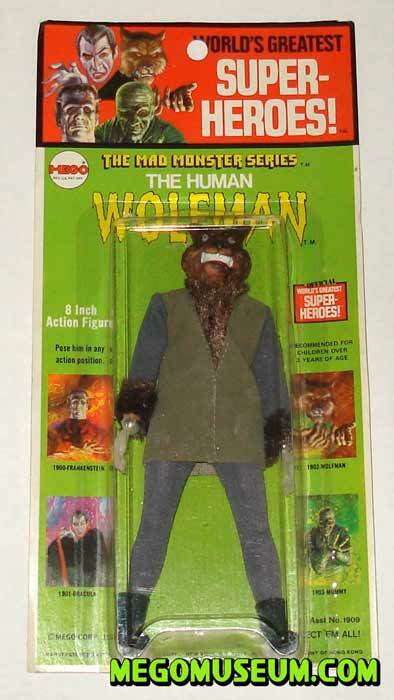 Classic TV Toys did the same thing with the hands on their reproduction of the Wolfman. The only version of the Wolfman without these hairy hands is the Lion Rock Version. With the Lion Rock release, all four characters in the Monster line had the same hands.